The touch enablement of Chrome OS continues, as well as the merging of look-and-feel elements between it and Android. 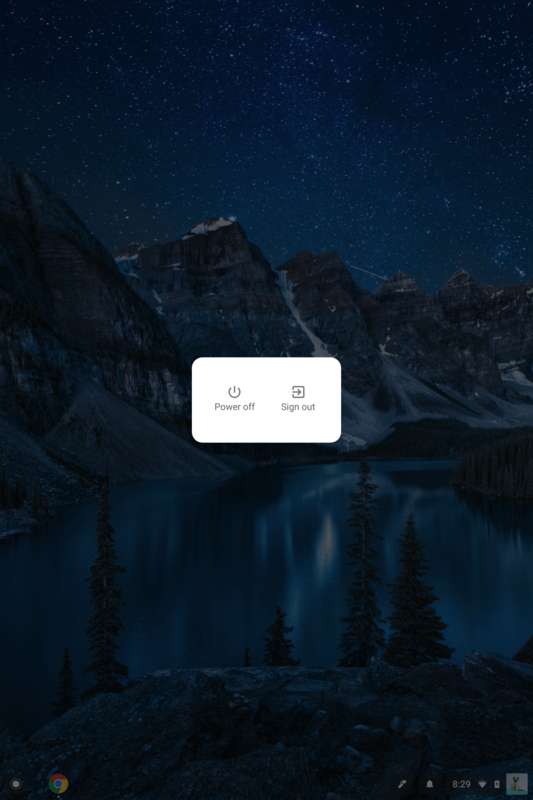 The latest example is in the Chrome OS Canary Channel, the pre-alpha builds of the platform, where you will now find the Power menu to look strikingly similar to its Android counterpart. The new came from long time Chrome OS evangelist François Beaufort who posted about the find on Google+. If you are a fan of Chrome OS, Francois is one you need to follow as he is great at finding these little nuggets, especially in the Canary Channel. In his post on G+, he posted an image of the new menu which you will find below. As you can see, it looks very similar to the new Power menu that came to Android phones with the Android Oreo 8.1.
Who the menu is access is similar to Android too. If you long press the physical power button on your touchscreen enabled Chromebook, this menu will be displayed. The Chrome OS Canary Channel is currently on Chrome 67 which is slated for a June release. It is likely that we will see this update to that build when it is released. The Commit for it is already in the Chromium Review Gerrit indicating that isn’t merely a “want to have” bit of code but one that’s made the cut into the platform.